Today Jason Godin, National President represented UCCO-SACC-CSN at the Senate Committee studying the issue of human rights of prisoners within the correctional system. In his testimony, Jason highlighted the need to retain administrative segregation as an essential tool for population management. The complete removal of segregation would prove to be extremely disruptive and dangerous to our work environment. In addition, the increased incidence of inmates with serious mental health conditions, particularly amongst female inmates, is impacting the daily operations of our Institutions and proving to be a huge drain on staff resources. To this end Jason reaffirmed the need to establish a specialized unit to treat and manage these high risk female inmates, something the Union has been calling for since 2005. In addition, the provision of on-site 24/7 Health Care coverage as recommended by the Ashley Smith inquest, was once again asked for by the Union. The Committee expressed great interest in the increasing incidence of PTSD amongst our membership and sought clarification on what resources are available to help those members suffering from occupational stress injuries. Our National President stated that progress is being made but reaffirmed the need to have more resources allocated to this particular area. In closing, the Committee recognized the "tough job" that we do and thanked us all for the hard work that we do on a daily basis within our Institutions. To read Jason's testimony click here. To watch the Senate Committee hearing please click here. Le 4 mars, 2016, le président et le vice-président de la région de l’Atlantique, Doug White et Jeff Wilkins ont rencontré le député de la circonscription de Miramichi-Grand Lake Pat Finnigan. Nous avons présenté à M. Finnigan les principaux enjeux défendus par les agents correctionnels,dont la négociation de la convention collective. Nous avons également informé M. Finnigan des enjeux locaux de l'’tablissement Atlantique et de la manifestation tenue la veille concernant les attaques aux liquides corporels. Nous lui avons remis une copie de la vidéo "bloody cells" et nous avons discuté avec lui de l'’mportance pour UCCO-SACC-CSN d'’voir un prélèvement automatique d'’chantillon sanguin pour les détenus. La situation du centre de paye a aussi été abordée. 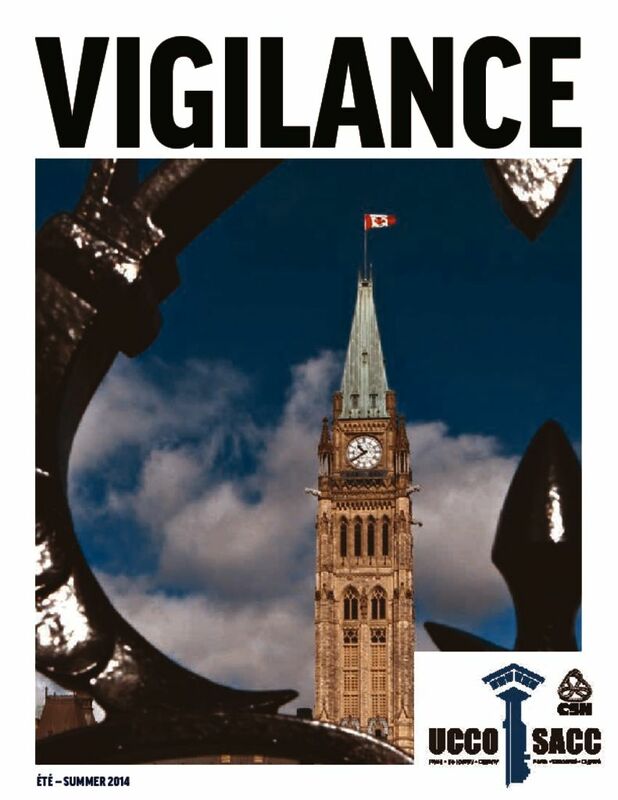 Legislation to repeal Bills C-377 and C-525 introduced in House of Commons OTTAWA, Jan. 28, 2016 /CNW/ - The Honourable MaryAnn Mihychuk, P.C., M.P., Minister of Employment, Workforce Development and Labour, and her Parliamentary Secretary, M.P. Rodger Cuzner, along with Parliamentary Secretary to the Minister of Infrastructure and Communities Pablo Rodriguez, today announced that legislation to repeal Bills C-377 and C-525 has been introduced. If passed, this will help restore balance in workplace relations. In addition, both Bills were passed without the tripartite (employer, union and government) consultation process traditionally used for labour relations law reform. The Government is committed to meaningful engagement and evidence-based policy development. Repealing Bills C-377 and C-525 is a priority for the Government of Canada and was included in the mandate letters of Minister Mihychuk and of the Honourable Judy Foote, Minister of Public Services and Procurement. This is part of the Government's plan to ensure Canada's labour laws best serve employees and employers. Quotes "Our Government recognizes that unions play an important role in protecting the rights of Canadian workers and in helping the middle class grow and prosper. That's why we're proud to be pursuing our commitment to help restore a fair and balanced approach to labour relations in Canada by repealing Bills C-377 and C-525." -The Honourable MaryAnn Mihychuk, P.C., M.P., Minister of Employment, Workforce Development and Labour "Bill C-377 and Bill C-525 have long been seen as solutions to problems that do not exist. Our Government is taking action to repeal these Bills and support the work of unions across Canada. - Parliamentary Secretary, M.P. Rodger Cuzner Quick Facts Bill C-377 came into force on December 30, 2015. However, given the Government's commitment to repeal the Bill, the Minister of National Revenue waived Bill C-377 reporting requirements for 2016 fiscal periods. Section 110 of the Canada Labour Code requires labour and employers' organizations to provide financial statements to their members upon request and free of charge. Many provincial labour statutes contain similar accountability measures. Bill C-377, An Act to amend the Income Tax Act (requirements for labour organizations), requires labour organizations to file detailed financial and other information with the Minister of National Revenue, which would then be made publicly available. Bill C-525, the Employees' Voting Rights Act, modified union certification and decertification provisions in three federal labour relations statutes by switching to a mandatory representation vote system and changing the thresholds required to trigger a vote.